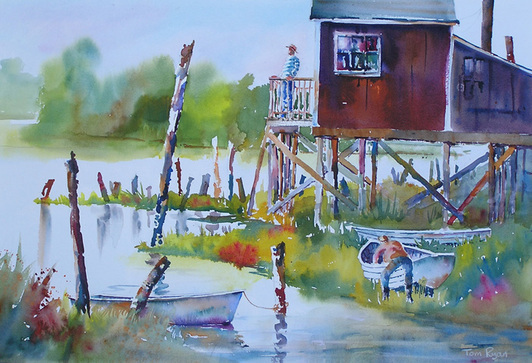 I love to create luminous watercolors that depict serenity, harmony, and beauty. Each color theme reflects my emotional response to the subject, with playful choices of color that are often unrelated to the actual color of the subject. Typically, my process begins with a wet-in-wet technique that allows the paint, water, and paper to spontaneously interact and create wonderfully mysterious effects and soft edges. Once the paper dries, I add strong vivid color for interest and to emphasize the focal point in the painting.